Like many athletes, ‘Sara’ felt that she was not reaching her full potential on the track. She knew that she was getting distracted and needed a plan to change her mindset. Focus is your ability to concentrate on certain key elements (aka cues) in your environment. Having strong focusing skills can allow you to concentrate on different cues that impact your performance. If you focus only on one cue within your performance, you’re at a higher risk of getting fixated on it. This is when the cue becomes a distraction. The good news is that if we change our mindset, we can overcome the distraction and refocus. 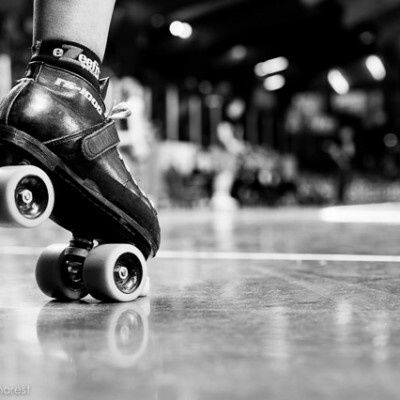 For this Mental Muscle post I had a one on one session with a Roller Derby Athletics member. This is Sara’s story, and the plan of attack we designed together. Sara is a jammer hailing from Finland. She used to play on the B-level travel team and was drafted to the A-level team a few years ago. Sara feels that she is holding back her power as a jammer. Whenever she reviews her team’s stats after a game, she feels that she wasn’t as effective as the other jammers on her team. Sara feels that she is holding back in games because she is afraid to make mistakes. As a jammer, a mistake can lead to a power jam for the opposing team. It’s a lot of unnecessary weight on one’s shoulders. When Sara was on the B-team, she felt that she received back block penalties frequently based on a combination of her technique of attacking a wall and her opponents’ lack of strength (high degree of impact). When she was on the A-team, she received fewer of these penalties, until last year when she received four back block penalties in one game. After that game, Sara became afraid of impacting a wall with her full strength again. The fear of getting a penalty became a distraction for Sara. 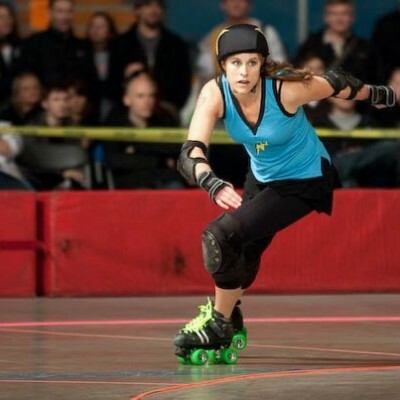 When Sara lines up on the jammer line, she takes a deep breath and visualizes powerful images in her mind. She sees powerful images like Wonder Woman, and past successes as a jammer. She feels strong and in control. But as soon as Sara needs to impact a defensive formation or is stuck behind one, she loses the confidence she had at the start of the jam. Instead of being able to focus in the moment, a wave of anxiety and panic overcomes her. The feeling of anxiety, panic, and disappointment takes Sara out of the moment. Remember that in order to play in the present, our minds needs to be focused on the present. This is why distractions can hinder one’s athletic performance. Our brains cannot think of two separate thoughts at the same time. If your mind is focussed only on a specific thought, feeling, or action, then it will not be able to effectively pick up on other cues within the environment. In Sara’s case, the overwhelming feeling of anxiety impedes her ability and confidence to attack defensive formations with full strength and focus. When lead jammer is declared, Sara will hear the whistle and use it as a cue to start her refocusing routine. This will help remove the negative association with the other team getting lead. Instead, it will put the control and focus back to Sara. Sara’s cue to start the refocusing routine is when she sees the star of the opposing jammer. Again, this cue is to help remove the negative association from being stuck in the pack. The goal of this routine is to remove the panicked feeling with a plan of action to help Sara stay focussed in the moment. Sara will start this refocusing plan as soon as she exits the pack. Without a plan, Sara is already thinking about impacting a formation with speed, possibly getting a penalty. This routine is to keep her mind in the present instead, and not on the ‘what if’ or penalties. The goal of each of these routines is to help Sara minimize the negative sensation that steams from her fear of failure. Just like any type of training, in order for Sara to see if her plans are working she will need to try them out and track her progress. We will touch base with Sara in a month’s time to see how her Refocusing Plans are coming along. You can see how simple a refocusing plan can be. Sara’s refocusing plans can be implemented with ease. At the end of the day, your refocusing plan is for you! Make sure it’s tailored to your needs. How can you apply these tactics we designed for Sara, to your own moments of distraction in the game? Can you use the process I’ve shown here to identify specific moments, and specific refocusing plans to overcome them?